Our theme this month is “God Is Truth, Truth In Nature.” The following paper comes from the forthcoming, “Encountering Earth: Thinking Theologically With a More-Than-Human World.” An inspired collection. Visit Wipf and Stock to learn more. That first trip flowed into countless more, as I paddled through the creeks, rivers, and lakes of central Ohio, in Lake Superior, and in wild Western rivers (the north Fork of the Flathead in Montana, the green river west of Denver) and the Pacific. This literal immersion in living, local, wild water—beginning in a sabbatical year that included also a month in a north Cascades wilderness context in December, several other multi-day outdoor immersions, and the transforming experience of reading David Abram’s The Spell of the Sensuous—opened me into the forms of thought emerging ever since. It is a way of thinking that strives for rigor without forfeiting our animal kinship with the world around us—an attempt to think in accordance with the senses, to ponder and reflect without severing our sensorial bond with the owls and the wind. It is a style of thinking, then, that associates truth not with static fact, but with a quality of relationship.2 What would it mean to do theology in this style: to think and speak as clearly and precisely as possible about the Christian tradition and its texts, beliefs, categories, rituals, from within experience of the natural world on its own terms, “without forfeiting our animal kinship with the world [and] in accordance with the senses”? I learned to swim in the ocean and spent my childhood immersed in the surge and tug of the tides, bodysurfing and diving under waves, and at least once in high Pacific surf nearly drowning. At age nine I was baptized into the Christian church in a temperature-balanced indoor baptistry. Both categories of experience—ocean swimming and baptism—involved bodily immersion in water, but nothing in the larger sets of stories or meanings attached to each led me to see any necessary connection between them. Through later ordination and scholarly vocation, I held together love of the natural world and Christian faith, and over the years I embraced the incarnational and sacramental interconnections between them. Only relatively recently, however—in this series of untamed water-encounters—did the faith into which my baptism immersed me dissolve for good into the larger fullness and wildness of the natural world. As I ponder the disconnect many experience between Christianity and the natural world, I have begun rethinking the practice at the threshold and center of Christian life: baptism itself. Into what reality does—and should—Christian baptism invite humans? Bonhoeffer did not live to develop what it might mean to think eco-logically within this framework, and certainly he never articulates any privileging of Nature over Scripture in the way this essay does. But as I have thought with his insistence on nondualism over many years, I am recognizing that it opens the door to the Christian thinkability of a hermeneutics by which insights from the Book of Nature are in fact allowed to critique, recast, or expand forms of thought and practice derived from Scripture and tradition.11 If indeed reality is nondualistic, such that one cannot defend a supernatural “revelation” incompatible with biotic interrelationship—that is, if (in Christian terms) the same Word of God that speaks in Scripture also speaks in trustworthy ways in and strangely permeates all of natural reality—then surely direct experience of the natural world can have a theologically critical role in Christian experience.12 And this role can, perhaps must, be one of revelatory priority, preceding Scripture. As Thomas Berry put it, “The universe, the solar system, and the planet Earth in themselves and in their evolutionary emergence constitute for the human community the primary revelation of that ultimate mystery whence all things emerge into being.”13 Here therefore, I wish to let my Alum Creek kayak experience open baptismal implications of immersion in living water, local water, wild water, including the riskiest theologos of all, namely pondering—still within the creek and its flow—the question of divine life into or by which we baptize. The test of this essay is not primarily in the strength or weakness of its various insights but in the degree to which its process generates new insight: does it work to think theologically more or less directly from the Book of Nature? What, if anything, makes such thinking Christian? The heart of what struck me in that first kayak journey into Alum Creek was the shock of discovering truly living water in a polluted urban creek. If this creek can contain so many species of all kinds, imagine how much must fill less degraded waterways—imagine, that is, how much biotic life of all kinds and phyla is implied in the term “living water.” It is into this fullness of life that baptism is meant to immerse Christians, a truth largely overlooked in the practice of indoor baptism in small bowls using dead treated, sterilized water. The early church’s baptismal practice famously specified immersion in living (i.e., flowing, natural) bodies of water, generally cold: “baptize . . . in living water. If you do not have living water, baptize in other water; if you cannot in cold, then in warm; if you do not have either, pour water on the head three times . . . .”14 Only in some kind of emergency would baptism apart from such “living water” be practiced. Yet in North American churches today this is the norm, with the effect that the practice of baptism is stripped of its original immersion into the larger interspecies context of a given place.15 Such practice echoes symbolically the damming and pooling of once freely flowing waterways of all sizes across North America and the world, to catastrophic effect. As those who live near—and, much more so, those who used to live within—areas flooded in dam construction know, dammed water is deadly: not only destroying what it covers but also low in oxygen, high in pollution and sediment, and fatal to the complex interconnected cycles of flow, migration, spawning, soil and plant nutrition, and hydrology once sustaining the entire surrounding watershed. Laura Donaldson articulates these interwoven biological, hydro-logical, and human complexities, showing how contrary to life contemporary water commodification and damming is, and highlighting indigenous texts and traditions of alternative relationality with land and water.16 Her coining of the term aquacide to describe such patterns of interlocking degradation and death is a shocking theological wake-up call. If the practice of Christian baptism requires immersion in living water, then Christians of most watersheds on Earth have work to do, difficult and slow, risky and economically challenging: to undam waterways, cleanse them of waste and pollution, reduce human over-consumption of fresh water, and devise alternative economies of energy, agriculture, and industry currently threatening these baptismal flows. For living water is necessarily local water, this water in this waterway, filled with these particular species and nourishing those specific others. Caring for living water requires getting to know these particular others, by name, by sight and sound, by humility and care. It requires getting to know one’s watershed as a whole: what impacts it, what threatens it, what helps and heals it. I have elsewhere argued for the importance of bio-regional grounding not just of Christian life (though certainly that) but of Christian ritual practice as well: that, in particular, baptismal renunciations and affirmations need to take forms specific to local biodiversity and vocation, as well as orienting participants to the larger transcultural promises and claims of Christian faith.19 A baptismal affirmation taking place in Alum Creek (see photos), with its Ohio diversity of freshwater shellfish, water plants, fish, insects, trees, mammals, etc., would sound and feel much different from a parallel rite taking place in my new home of Thousand Oaks, California, where the spring-fed (and runoff-polluted) creek running through Wildwood Park and over Paradise Falls nourishes a very different assortment of lizards, birds, insects, plants, and challenges. 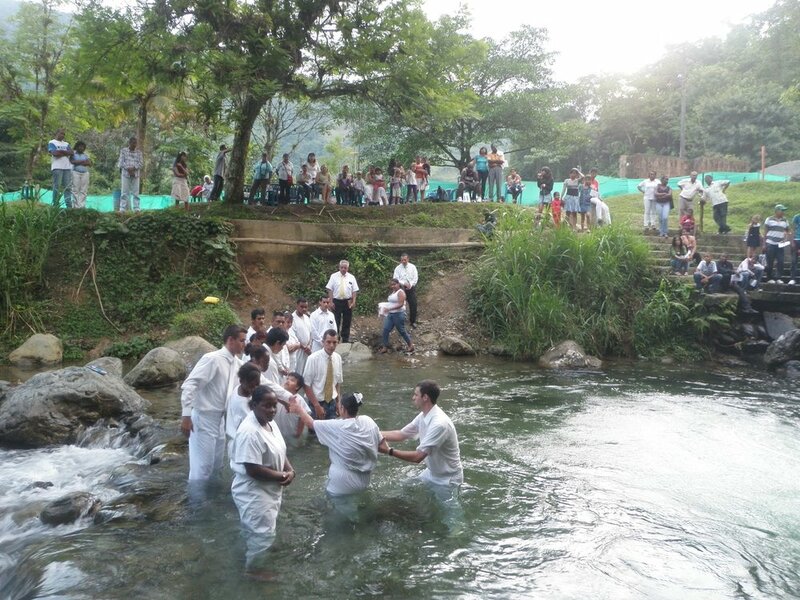 Baptizing in local waters also challenges the practice of reliance on imported and/or bottled water, obliging Christians to learn to live within the limits of their watershed and to resist the practices of water commodification and profiteering that deprive millions of people worldwide of clean local water. More recently I have been considering how experiences like the one at the outset of this essay give rise to a fundamentally animist perspective.Ggraham Harvey uses the term animism “to refer to ways of living that assume that the world is a community of living persons, all deserving respect, and therefore to ways of inculcating good relations between persons of different species.”20 Getting to know my local watershed as a baptismal practice is inviting me into this animist vision precisely as an expansion of dominant forms of Christianity. That is, I understand baptism into local waters to mean immersion not only into the body of Christ (a human abstraction, albeit a meaningful one) but even more significantly into this larger sensory-physical relationality with the natural world: experiential kinship with creatures in the watershed of every phylum and kind, with local humans of diverse cultures and religions, and with natural forces and elements, all expressions of the wild Logos. In this animist vision every creature and element is experienced as a real or potential Thou, the waters and watershed our sanctuary, our home, the wildness of it all the closest we shall come perhaps to the divine. Thus, out in the water, wanting to relate meaningfully and responsibly with the particular Thous I encounter there, I find myself immersed not (only) into the divine “persons” of the Christian Trinity but into the mutuality of personhood of all these creatures . . . and into what might be considered the personhood of the waterway itself. But the encounter with wildness goes even further. Christians have long noted parallels between the great flood of Noah’s time, destroying nearly all life on Earth, and the terrors of drowning implicit in baptismal metaphors and practice. Wild water is terrifying water, as survivors of raging flood-waters know, able to sweep away humans and our lives in an instant, and we do well to respect it. I’ve had my share of frightening encounters with wild water, from that childhood near-drowning to unexpected river rapids; and those vulnerable to rising seas and strengthening storms in this era of climate instability and chaos know much better than I do how destructive wild water can be to humans.22 The wildness of a creek or ocean is part of its larger baptismal significance, including not only the force of the water itself but also the proliferation of its microbes in our guts from exposure to polluted water, the possibility of encounter with coyote or mountain lion or rattlesnake along these banks, the fact that creek edges are often home to humans on the edges of society. Surely one of the most vexing questions of theological language has to do with the verbal baptismal formula, specifically the triune name with which initiates are baptized. The traditional formula, by which persons are baptized “in the name of the Father, the Son, and the holy Spirit,” emerges from key loci of the Christian Scriptures and early Christological debates, and it provides a powerfully transcultural and cross-generational invitation into the tradition, including (unfortunately) the tradition’s symbolic andro- and anthropo- centrism. It is less successful, however, as language for inviting people into the mystery, physicality, wetness, wildness, and strangeness of the local watershed, the larger biosphere, or the encompassing cosmos into which a truly adequate baptismal practice must surely invite Christians today. I’m intrigued with the use of “water” as a name of God at baptism for the reasons Armour develops above. If we truly believe that in Christ God and the world are fully united and the world already permeated with all the holiness available to us, we need forms of ritual speech that reflect this one reality. 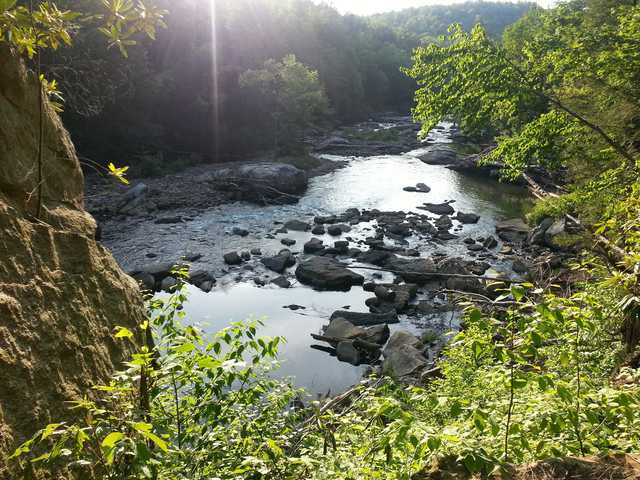 The formula of a rite inspired by the holiness of Earth’s actual waters might, for instance, name God-as-water here in this local river, in the Spirit/breath of all life, in the wild wisdom permeating the biosphere. “Name, I baptize you into Water: [the Pacific Ocean, Lake Huron, Alum Creek], holy Breath, the Life of the world.”27 If the traditional formula represents a baptism into the world opened by the Book of Scripture, then a version like this is an attempt to articulate baptism into the same world named through the Book of Nature. For Earth’s waters polluted, depleted, hoarded, cherished, and wild are the “living waters” into which the Spirit immerses Christians. Being joined here to Christ incarnate, crucified, and risen inaugurates the conversion we need. Map of continental US’s rivers and river basins. More here, here and here. My encounters with living water, beginning with that kayak trip on Alum Creek, have borne me into what may seem an anomalous articulation of what Christian baptism means. Popular views of this sacrament tend to center in personal salvation, or larger human-communal belonging, or relationality with a deity fundamentally separate from (if intimately joined to, indeed incarnate within) the larger animal, vegetal, and mineral world. My immersions into living, local, and wild waters have broken open the unconsciously dualistic ways I too had previously thought of baptism. I am coming to view this sacrament instead as the invitation for Christians who worship this incarnate God—fully joined to the creation in one reality—to let psyche/spirit be reunited with our body’s world, that watery life of all creation, and thus rejoined to the bodies of Earth itself, our heaven, our home. Here in the water we meet all kinds of creatures, being at last restored to our own full humanity—for, as Abram reminds us, “We are human only in contact, and conviviality, with what is not human.”28 Here in the water we also meet lots of other humans, Christian or not, who share our dependence on these waters, and this encounter too invites us at last into the fullness of Christian faith—for surely, similarly, we are Christian only in contact, and conviviality, with those who are not. And finally, we meet here the sacred mystery, the ordering, intelligence, wit, and spark-fire of the vast creation itself, inviting us into the fullness of our gratitude (Latin gratia,grace) to past generations of Earth creatures who make up our flesh, into relationship with present creatures of all species and kinds, and into shared responsibility for future generations: that they too may flourish in these living, local, and wild waters. Dr. Lisa Dahill is a former Carnegie Scholar, currently serving as Assoc. Prof. of Religion at California Lutheran University. Read more of her writings on AllCreation here.